(Nanowerk News) Friction is all around us, working against the motion of tires on pavement, the scrawl of a pen across paper, and even the flow of proteins through the bloodstream. Whenever two surfaces come in contact, there is friction, except in very special cases where friction essentially vanishes — a phenomenon, known as “superlubricity,” in which surfaces simply slide over each other without resistance. 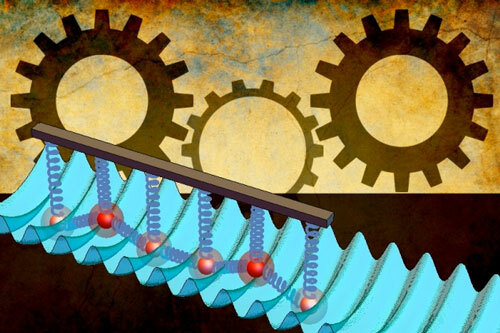 Vladan Vuletic, the Lester Wolfe Professor of Physics at MIT, says the ability to tune friction would be helpful in developing nanomachines — tiny robots built from components the size of single molecules. Vuletic says that at the nanoscale, friction may exact a greater force — for instance, creating wear and tear on tiny motors much faster than occurs at larger scales. Vuletic, along with graduate students Alexei Bylinskii and Dorian Gangloff, publish their results today in the journal Science ("Tuning friction atom-by-atom in an ion-crystal simulator"). The team simulated friction at the nanoscale by first engineering two surfaces to be placed in contact: an optical lattice, and an ion crystal. The optical lattice was generated using two laser beams traveling in opposite directions, whose fields add up to form a sinusoidal periodic pattern in one dimension. This so-called optical lattice is similar to an egg carton, where each peak represents a maximum electric potential, while each trough represents a minimum. When atoms travel across such an electric field, they are drawn to places of minimum potential — in this case, the troughs. Vuletic then engineered a second surface: an ion crystal — essentially, a grid of charged atoms — in order to study friction’s effects, atom by atom. To generate the ion crystal, the group used light to ionize, or charge, neutral ytterbium atoms emerging from a small heated oven, and then cooled them down with more laser light to just above absolute zero. The charged atoms can then be trapped using voltages applied to nearby metallic surfaces. Once positively charged, each atom repels each other via the so-called “Coulomb force.” The repulsion effectively keeps the atoms apart, so that they form a crystal or lattice-like surface. The team then used the same forces that are used to trap the atoms to push and pull the ion crystal across the lattice, as well as to stretch and squeeze the ion crystal, much like an accordion, altering the spacing between its atoms. In general, the researchers found that when atoms in the ion crystal were regularly spaced, at intervals that matched the spacing of the optical lattice, the two surfaces experienced maximum friction, much like two complementary Lego bricks. The team observed that when atoms are spaced so that each occupies a trough in the optical lattice, when the ion crystal as a whole is dragged across the optical lattice, the atoms first tend to stick in the lattice’s troughs, bound there by their preference for the lower electric potential, as well as by the Coulomb forces that keep the atoms apart. If enough force is applied, the ion crystal suddenly slips, as the atoms collectively jump to the next trough. The group continued to stretch and squeeze the ion crystal to manipulate the arrangement of atoms, and discovered that if the atom spacing is mismatched from that of the optical lattice, friction between the two surfaces vanishes. In this case, the crystal tends not to stick then suddenly slip, but to move fluidly across the optical lattice, much like a caterpillar inching across the ground. For instance, in arrangements where some atoms are in troughs while others are at peaks, and still others are somewhere in between, as the ion crystal is pulled across the optical lattice, one atom may slide down a peak a bit, releasing a bit of stress, and making it easier for a second atom to climb out of a trough — which in turn pulls a third atom along, and so on. “What we can do is adjust at will the distance between the atoms to either be matched to the optical lattice for maximum friction, or mismatched for no friction,” Vuletic says. Gangloff adds that the group’s technique may be useful not only for realizing nanomachines, but also for controlling proteins, molecules, and other biological components. Tobias Schaetz, a professor of physics at the University of Freiburg in Germany, sees the results as a “clear breakthrough” in gaining insight into “otherwise inaccessible fundamental physics.” The technique, he says, may be applied to a number of areas, from the nanoscale to the macroscale.